While climbing in Italy I noticed quite a good system used for lowering off the route. It was a sheepshead. Asolid steel bar with 2 hoops on either side that the rope was placed over. No biners that can get stolen very quick and easy to use. Or a carabiner used solely for lowering off that would discourage anyone from removing it as it would not be able to be used to make up an extra quick draw etc. Opinions, ideas, thoughts and advice would be welcome. We don't have any sheepshead in SA (that I know of) but we do have the biners. 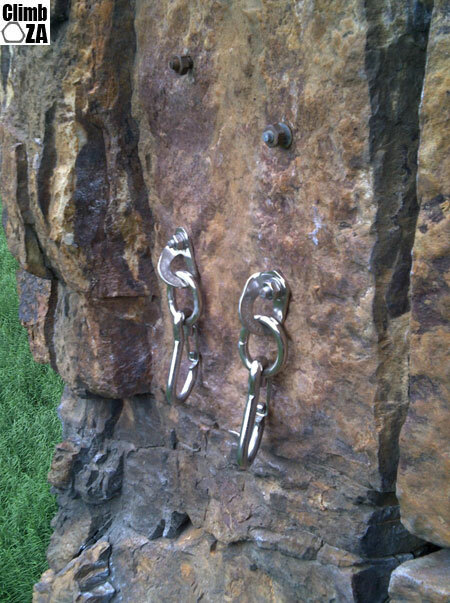 We are lucky enough to have CityROCK supply the anchors at cost - currently there is no stock of these anchors in SA, but more are on order. There are a couple of other routes with biners at the top (most well know is Eddy of Bovidence at Legoland). These 'quick clip' top anchors are very cool - see the comments in the above post re: the biners facing the wrong direction. these should actually be standard for all bolted routes it is far safer, quicker and less hassle. but expensive...! If you are the chap paying for them.